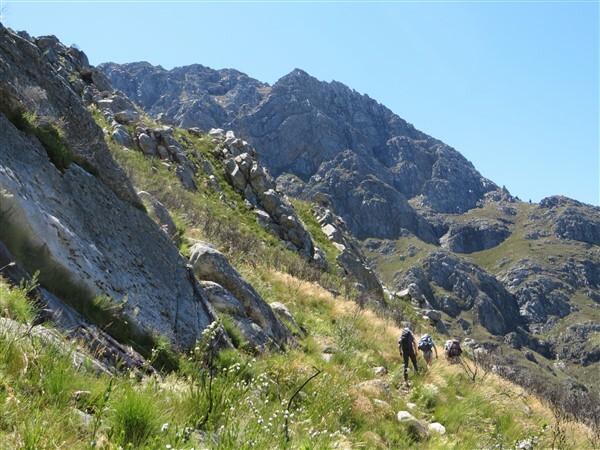 Arangieskop is a high mountain peak near Robertson, often rated as the most demanding hike in the Western Cape. Attendance is by invitation only and is limited to senior scouts. After a short drive from Cape Town, we arrived in Robertson and parked at a small cottage around 1km from the start of the hike. We made the short walk to the start of the hike which took us along a gravel road, over a fence and along more gravel road. It was clear where the hike actually started, because this is where we started going up. The first part of the hike was continuing along the steep gravel road, which eventually led into a path. This path continued going up and along a ridge, which lead onto a steep downward path into a valley. 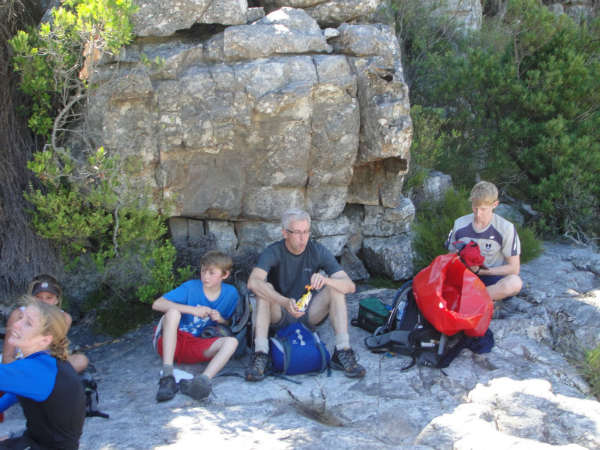 Here we stopped for a rest and to refill our water bottles. After walking along the valley floor for a while, we reached a steep upward path that took us out of the valley. Here, we started hiking up zigzags. We could now clearly see the saddle we were aiming for. The zigzags seemed to last forever, before we reached another spot to fill our water bottles and have short break. The path then continued up and onto a few more zigzags before we reached the saddle. 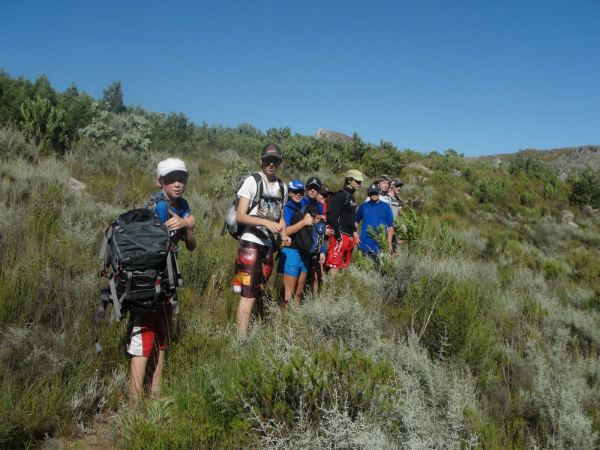 Here it was a short, flat hike to the Arangieskop cabin. Here, we had a very rewarding view down onto Protea farm and the rest of the Koo valley below. After enjoying our dinner and some friendly chatter with another group of hikers, we went to sleep. 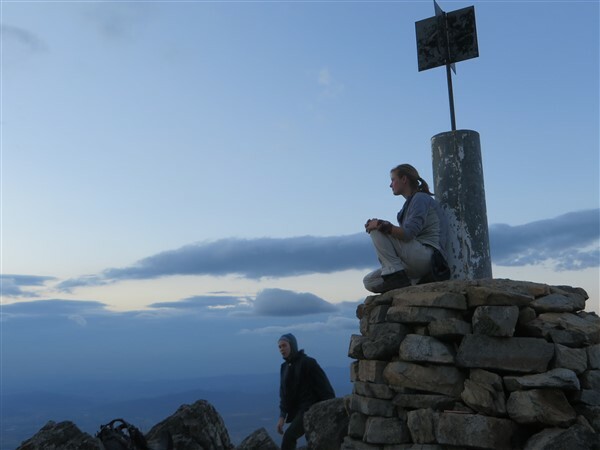 The next day, we woke up early to make it to the top of Arangieskop to see the sunrise. After our breakfast, we started around a two kilometre hike to the peak. We arrived just as the sun was rising. Here we also discovered a small can with notes from previous hiking parties inside. We wrote our own note and then headed down. The path took us down a ladder and into a deep valley. The path zigzagged from one side of the valley to the next until we reached a forest. Here, the path flattened out as we made a few crossings, back and forth over a river. We then continued hiking around a spur and onto an extremely eroded path which lead all the way around another valley. On the other side of the valley, we hiked along a flat path which eventually started to zigzag down. These zigzags seemed to last forever, but eventually met a road. We hiked along this road for a couple hundred metres and onto another path. 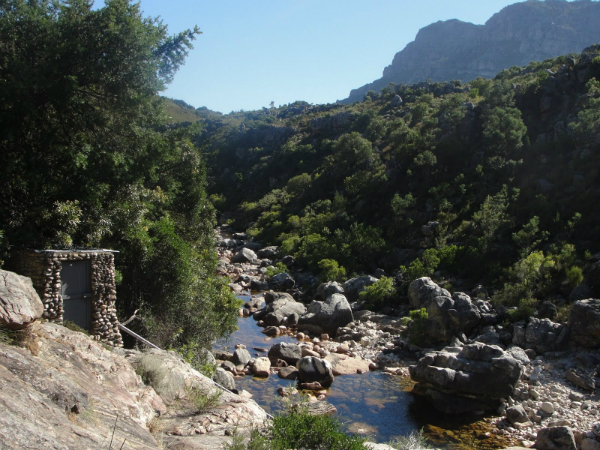 On this path, we hike around a small koppie and then zigzagged down to where we had started the day before. After the walk along the road, we got back to the cottage where we had a very rewarding Coke and biscuits.